Jonathan Aguilar Garcia or better known as “Chokoleit” is a famous Filipino comedian who recently went viral on social media after posting numerous yet hilarious edited photos of him on various photos. This attracted netizens and made them laugh so hard when they saw his face in the said photos. One of Chokoleit’s best appearance in Philippine television was his role in ABS CBN drama series, starring drama actress Claudine Barreto as Marina, which aired on February 23, 2004, to November 12, 2004. He played the role of Pearly shell, a gay shokoy and a slave of Dugong. He became a slave when Dugong mistook him as a real man when she was looking for a victim. He also played roles in several TV series and movies such as Dear Uge, Etiquette for Mistresses, Juan Dela Cruz, Call Center Girl, Aryana, Mara Klara, Volta, as one of Ai Ai’s best friend, One Night Only, Kampanerang Kuba and so on. Chokoleit’s acting skills were recognized but what the people liked about him was his ability to make use laugh. Recently, Chokoleit posted some of his edited photos on social media, particularly on Instagram where most of his fans are active. Chokoleit’s funny antics on social media would always make us smile but what he did on his latest posts set the bar higher. In various magazine covers and random photos, he swapped the model’s face with his own looking like it was the original thing. 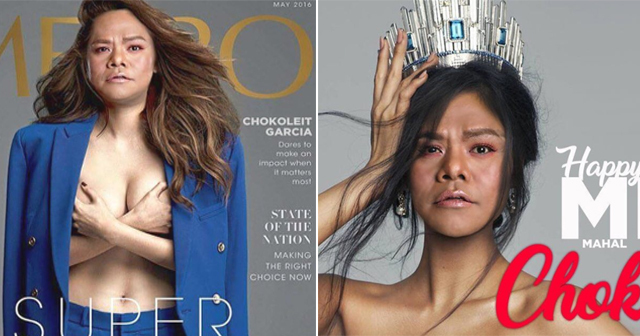 Netizens immediately caught on, sending praises to Chokoleit for another dose of laughter. What are your thoughts on these pictures of Chokoleit? Did it make you laugh?